Heat the sesame oil in a pan and sauté the diced shallots until they become translucent. Also sauté the pineapple, mango and banana. Gradually add the stock and all the other ingredients (apart from the starch, coconut milk, ginger and a couple of chervil leaves for decoration) and simmer slowly for 20 minutes. Stir the corn starch with the coconut milk. Now stir in the coconut milk with the finely chopped ginger into the sauce and bring to the boil again. Peel the potatoes and cut into rough cubes. Simmer slowly in a pan with the cream for about 50 minutes. Then use a mixer to process the cooked potatoes into a puree. Slowly roast the nuts in a frying pan on medium heat till they are golden yellow in color. Add the scallops to a hot grill pan and grill each side for one minute. As soon as the scallops are ready arrange the puree on the center of the pre-warmed plates. Add the scallops (3 pieces) on the top. 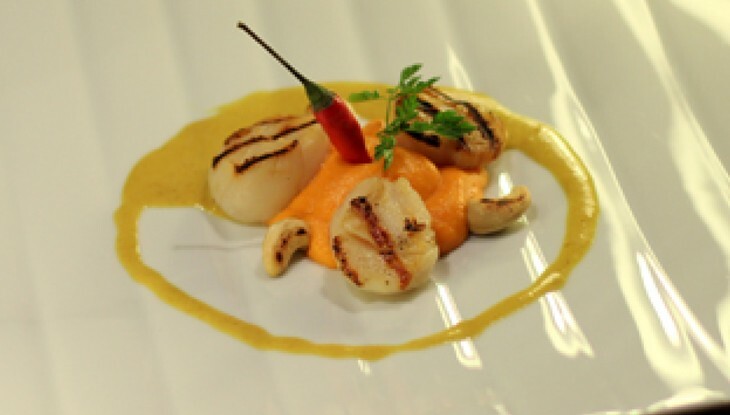 Pour the curry sauce around the puree and the scallops, and decorate with chervil, the chili pepper and the roasted nuts.